NRM community groups play a significant role in our region by bringing people together to improve land management practices, restore our landscapes and conserve natural resources in their local area. NRM community groups include volunteers affiliated with Landcare groups, other community ‘care’ groups (environment and NRM collectives), Indigenous groups and not-for profit organisations. Many of these are volunteer groups that have varying levels of membership, knowledge and expertise to undertake ongoing activities to improve environmental sustainability. 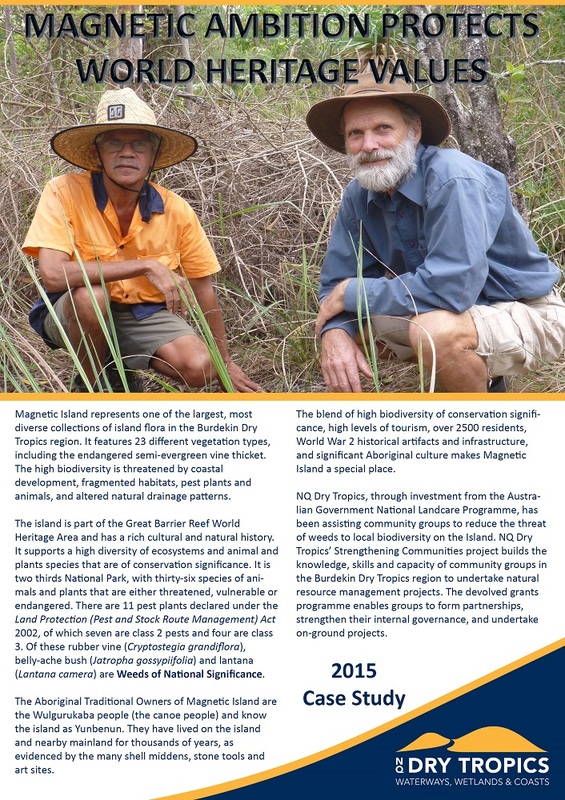 Several not-for-profit organisations, including NQ Dry Tropics, play an important role in building NRM community connections and capacity through extension, education and on-ground work. It is vital that local NRM community groups are empowered and supported to strengthen their community links, expand the size of their networks, and maintain the momentum created by their good work. This can be achieved by providing opportunities to build capacity and to share information and experiences. Join our Volunteering Dry Tropics Facebook page to find events and community group information in the Burdekin Dry Tropics region.